Aizawl, Feb 20 : Just four days ahead of the by-election, campaigning Tuesday gained momentum in the tribal dominated Chalfilh assembly constituency in Mizoram. Though the Feb 23 by-poll has seven candidates in the field, including Bharatiya Janata Party aspirant C. Ramkinlova, the main contest would be between ruling Congress nominee Ngurdingliana and the main opposition, Mizo National Front (MNF) candidate Lalvenhima Hmar. The assembly segment was lying vacant after the death of parliamentary secretary and Congress legislator Chawngtinthanga Sep 16, 2012. 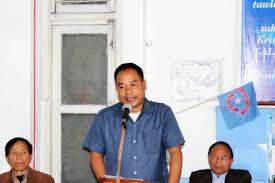 Mizoram Chief Minister Lal Thanhawla of the Congress and MNF chief Zoramthanga along with leaders of their parties have been campaigning for their candidates. Ngurdingliana is the son of veteran Congress leader and former state assembly Speaker H. Thansanga, and had contested unsuccessfully in the 2008 assembly elections from the same constituency. Mizoram Chief Electoral Officer K. Riachho said, a total of 17,054 people, including 8,346 women, are eligible to cast their votes in the by-poll.